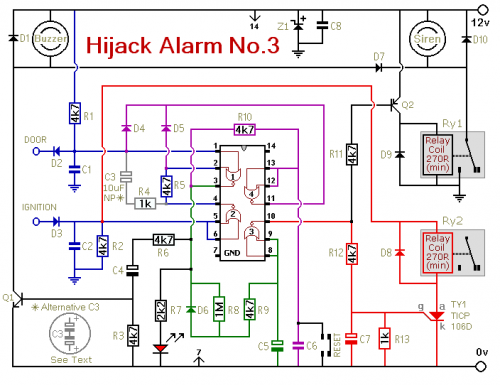 this circuit was designed primarily for the situation where a hijacker forces the driver from the vehicle. If a door is opened while the ignition is switched on - the circuit will trip. After a few minutes delay - when the thief is at a safe distance - the Siren will sound. Where it differs from the first two alarms - is in what happens next. I'm obliged to Victor Montanez from the USA who suggested that the engine cut-out should not operate - until the vehicle comes to a stop. That way - the engine will not fail suddenly or unexpectedly. And the hijacker will retain control. I haven't been able to implement Victor's excellent suggestion completely - because I couldn't think of a simple, reliable and universally applicable way of sensing when the vehicle has come to a stop. Instead - I have postponed engine failure until the ignition is switched off. Once the thief turns off the ignition - the engine will not re-start. Clearly - there is no certainty as to when this will occur. But I think it will occur sooner rather than later. Because there's a strong possibility that the hijacker will turn off the ignition - in an attempt to silence the siren. 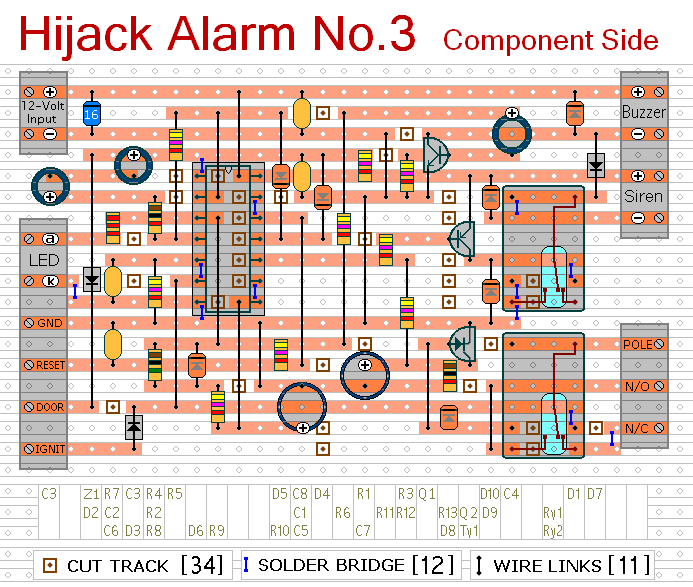 As well as acting as a Hijack Alarm - this circuit offers some added protection. 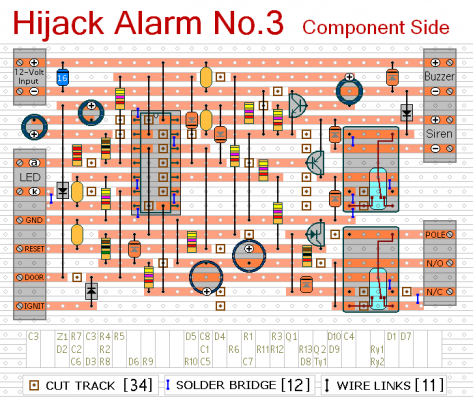 Like the Enhanced Hijack Alarm - it incorporates Jeff Chia's suggestion. That is - every time the ignition is switched on - the alarm will trip. So it will protect the vehicle whenever you leave it unattended with the ignition switched off - even overnight in your driveway. You're going to trip this alarm unintentionally. When you do - the LED will light and the Buzzer will give a short beep. The length of the beep is determined by C4. Its purpose is to alert you to the need to push the reset button. 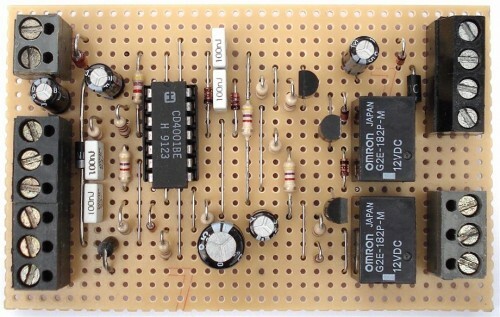 When you push the button - the LED will switch-off. Its purpose is to reassure you that the alarm has in fact reset. If the reset button is not pressed then - about 3 minutes later - both the Siren and the Buzzer will sound continuously. The length of the delay is set by R8 & C5. For extra effect - fit a second siren inside the vehicle. With enough noise going on - you may feel that it's unnecessary to fit the engine cut-out. In which case - you can leave out C7, D8, R12, R13, Ty1 & Ry2. When the ignition is switched on - C3 & R4 are responsible for tripping the alarm. By taking pin 1 low momentarily - they simulate the opening of a door. If you don't want the alarm to trip every time you turn on the ignition - simply leave out C3 & R4.